We had our I held the 2nd Food Swap - Officially now known as the Collingswood Food Swappers, this past June 25th. Our event was held at The American Table on Haddon Avenue, in Collingswood. I've been teaching cooking classes here for the past few months (with a big schedule to be rolled out for the Fall!) and the owner, Cyndi, said that I could use the store's space for my next swap if I wanted. I'm glad I chose to use the space, as it worked out perfectly for our "inaugural" swap. Interest is still gaining ground - I'm getting inquiries from all over as well as followers on the Facebook Page. In addition, the swap was "covered" by the press! Matt Skouflas, of the Collingswood Patch, stopped by at the start of the night and video interviewed me, Cyndi, and some of the other attendees for a video story on the Patch's website. My friend, Dave, joked with me, asking if I was shooting for some coverage by The New York Times! Well, Dave, I'll work my way up to that level, one news story at at time, sir! About 14 people attended the swap, from all over the area - many coming from the immediate neighborhood, past swapper friends and neighbors, Susannah and Dave (who brought an ethereal flaky goat cheese, thyme and berry hand pie). I met new folks from town, Jodi, Jennifer and Linda, three friends and lovely ladies all. Their contributions were all prize winning goods and packaging! Quinoa Tabbouleh Salad; Sweet Berry Hand pies; Salt and additive free Taco Seasoning. Marisol, a woman who contacted me via the Event Brite page, also joined us. She lives up the street from store. She brought 2 items, lavender spray and iced tea. The iced tea was most refreshing as is the lavender spray. I love it when you have items that will last for a while and continue to give you joy! From further away, Mary came in from Manheim, PA - which is in Lancaster County! She is interested in hosting a food swap in her area, and since she has friends and family in Collingswood, she made the special trip down to our area to check us out, get some ideas and share her delicious Strawberry Margarita Jelly. I felt so special having a guest drive such a distance for the event! From the Philadelphia area, fellow blogger and food swapper, Casey, who writes at SaltedPlates.com, came over to our side of the river. We met briefly at the Philly Food Swap in April, and we've been fans of each other's blogs and Facebook and Twitter postings ever since. Casey brought a delicious and easy to make Vegan Mustard. Her mustard and her writing continue to inspire me! My very dear friend, Stefanie, joined us as well. She couldn't make my May event and it was a real treat to have her spend the evening with us. She lent moral support, helped to organize some of the set up and break down for the evening and she also schmoozed and mingled with the guests. Plus, she brought a killer pineapple sambal. Great on meat or fish but also terrific right out of the container! My co-host, owner of The American Table, Cyndi, made a scrumptious paring of Zucchini Bread with home-made Honey Butter. I think it and the goat cheese thyme berry hand pie were both devoured within minutes of my getting into my house! My offering for the night was something a bit different for me - I made a big batch of barbecue sauce, using a milk stout beer, along with copious amounts of tomato, molasses, smokey spices, soy sauce and other zesty spices. I thought I would make it and bring it as a refrigerated item. Around 10 pm the evening before the swap, I decided to can the sauce instead! It took a few more hours to do, but in the end, it was worth the extra effort. I canned a dozen jars, two sample jars and still had three pints remaining for future use! 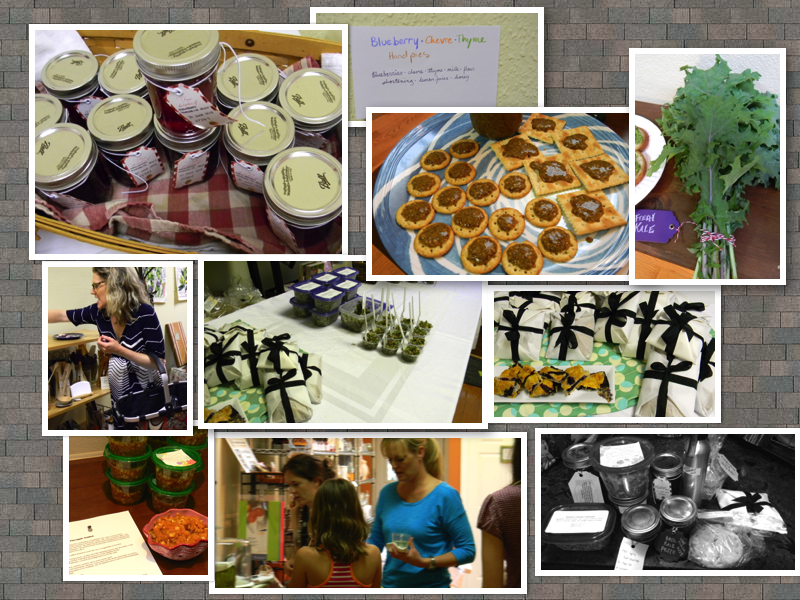 Another successful event, with plans to host our next swap in Early August. 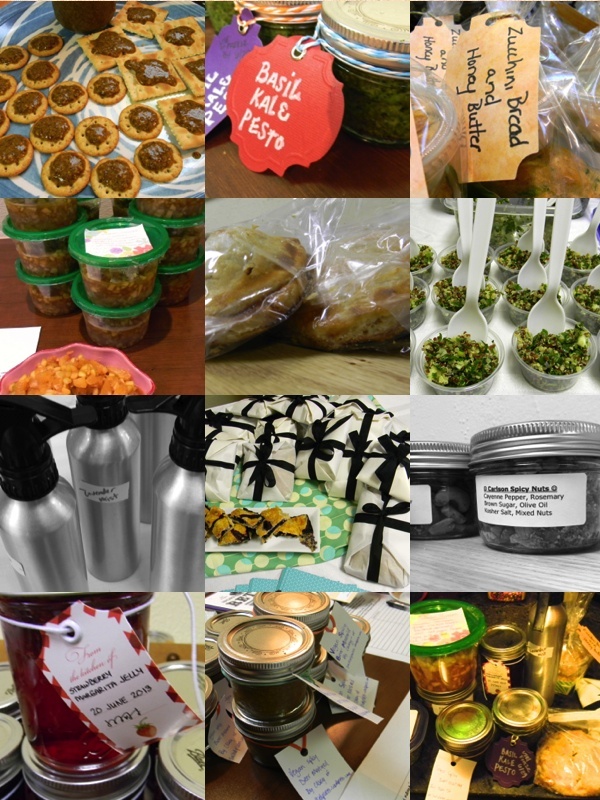 Check out our Facebook Page - Collingswood Food Swappers, for the date and location! For the next swap, I'm thinking of doing more of a party theme, and making it a beer swap - not necessarily home-brews, rather, one's favorite brews to taste and share.